Edible landscaping is the number one consumer trend today according to Independent Garden Centers, as the locally grown movement gains ground, and more and more gardeners find success harvesting their own crops. Enter Urban Apples® from Garden Debut®, slender new apple trees that yield great tasting apples in a tiny space. What could be more ideal than a “containerized orchard” on a sunny deck, or planted in the backyard? This is possible with Urban Apples® from Garden Debut®. Use your harvest in a simple upside-down cake recipe that combines the great autumn flavors of apples and caramel. 1. Coat cake pan with oil. 2. Place Urban Apple® slices in an attractive pattern in the cake pan. 3. Slowly melt caramels and water in a small saucepan over low heat. 4. 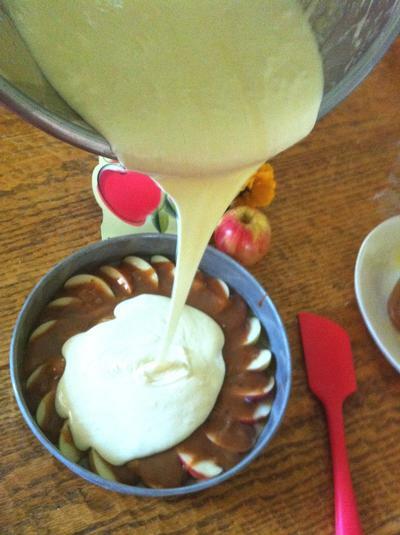 Pour melted caramel over apple slices without disturbing. 5. Mix cake batter according to directions. 6. Pour batter over caramel and apples. 7. Bake at 350 degrees F. for 25 minutes, or until cake is lightly brown and separates from pan. 8. Flip cake onto serving dish and enjoy!